Feelin’ lucky? Get your Irish on for St. Paddy’s Day with this traditional Cloture Cocktail recipe for Irish Coffee, courtesy of the Four Seasons Hotel in Dublin, Ireland. 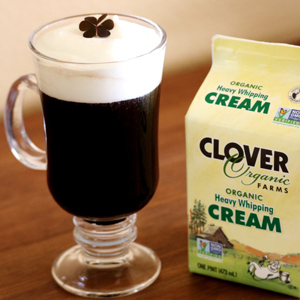 Our Clover Organic Heavy Whipping Cream shines as the crowning touch on this festive drink made with fresh brewed coffee, brown sugar and, of course, a jigger of best quality Irish Whiskey. Guaranteed to make you feel like you’re basking on the Emerald Isle, this very adult libation is the perfect way to celebrate like a leprechaun. 1 : Fill a footed glass Irish Coffee mug with two-thirds hot coffee. 2 : Add brown sugar and stir to dissolve. 3 : Add Irish Whiskey and stir to mix. 4 : Top with a 1” layer of thickened Clover Organic Heavy Whipping Cream.